Sea Air are your local commercial air conditioning installation specialists on the Sunshine Coast and across North Brisbane. We offer a range of air conditioner options with a climate control solution for every sized office, shop, restaurant, warehouse, or commercial property. Need a new air con installed? Our team can help you pick the best unit for you and install it as quickly as possible. We supply and install a comprehensive range of cool only or reverse cycle single split system, multi-split system, and ducted air conditioning options for every heating and cooling need. Sea Air air conditioner installation service covers new builds, upgrades, and retrofitting to existing buildings. Regardless of what stage you need the air conditioner installed, we can help. Modern air conditioners offer a huge range of features to boost energy efficiency, maintain clean fresh air flow, and increase comfort. Zone control - create zones to allow for varied temperatures throughout the building. Versatile design with wall mounted split, or ducted ceiling vents as well as cassette or floor options. DC power for reduced power consumption. 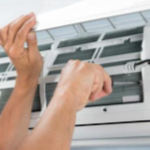 For the very best in commercial air conditioner installation throughout Brisbane northside and the Sunshine coast contact our experienced team on 0401 787 183 or complete our service request today. Installation vehicle, equipment and installation team must have clear and unhindered access to the site and internal/external location. Head unit will be mounted on a perimeter wall with nothing under the head unit (eg. window). Mounting above a window is possible, but may cost more as more materials are used. Piping supplied will be up to 3 m and ducting up to 2 m. If extra length required, additional costs will be $35.00 per metre out of duct, $55 per metre in duct and $16.50 for 90 deg bends / extra wall -ceiling caps. Wall is either brick or fibre, If the wall is Concrete or besser-brick core drilling fees apply ( usually $220 inc GST). Hole will be sealed with acrylic filler and end cap installed, over the hole. 2.5kw to 4.4kw Units: Wiring included in the installation will be up to 15 m to general power circuit. 5kw to 9kw Units: Wiring included will be up to 25m to switchboard in accessible roof space or accessible under the house, with a new circuit breaker installed (if under house +$2.20 per 1m of conduit & saddles). Rubber pads will be supplied for hard, flat surfaces otherwise ( poly slab base $33, extra wall brackets $75 extra. If outdoor unit (greater than 3.5kw ) needs to be mounted up high above 1.5m, there is a $88 fee for the Material lifter hire. When running piping behind the outdoor unit, piping / cabling will be zip tied to the back of the unit unless notified otherwise. We will refuse installation if the inside or outside wall is made of asbestos.